Prayer flags are said to bring happiness, long life and prosperity to the flag planter and add compassion to the universe. 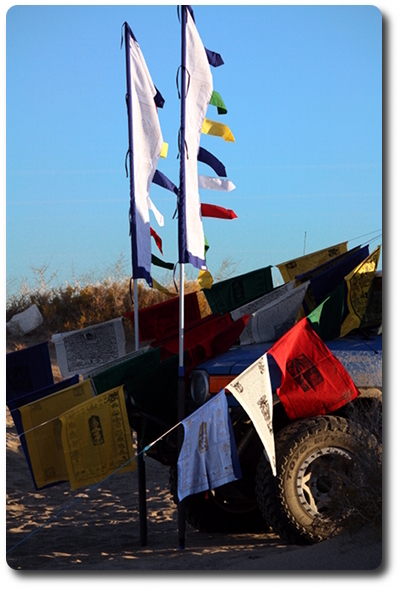 Displayed on an adventure, prayer flags impart a feeling of harmony and show respect for the environment and all beings. Prayer flags are displayed horizontally or fastened to bamboo, wood or metal poles for vertical display. The two (2) panel vertical prayer flags fit nicely over a four (4) foot CB antenna allowing you to easily display the flag when stopping for the night. 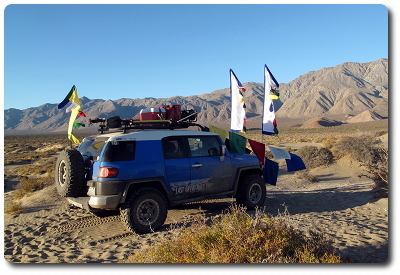 Places yours outdoors at your base camp where the wind can carry their mantras on the breeze. Following traditional methods, these prayer flags are hand printed in Kathmandu, Nepal by craftsmen on high quality 100% cotton fabric with non-toxic, colorfast textile paints. The details in each design are quite precise and the colors are pure and bright.